We are gathered here today to celebrate one of life's greatest moments, The Joining of 2 hearts. In this ceremony today we will witness the joining of GROOM/BRIDE and GROOM/BRIDE in marriage. The Hawaiian word for love is Aloha. Today we’ve come together to celebrate the special Aloha that exists between Groom’s/Bride's Name and Groom's/Bride’s Name and their desire to make their Aloha eternal through the commitment marriage. Groom’s/Bride's Name and Groom's/Bride’s Name you are entering into marriage because you want to be together. You are marrying because you know you will grow more in happiness and Aloha more fully as life-mates. You will belong entirely to each other, one in mind, one in heart, and in all things. No greater blessing of happiness can come to you than to have this devoted Aloha, which you now publicly affirm. Keep this understanding of your marriage alive in the days ahead. May your Aloha continuously grow truer and more wonderful with each day you enjoy together. I, GROOM’S/BRIDE'S NAME take you GROOM'S/BRIDE’S NAME to be my husband/wife, my partner in life and my one true love. I will cherish our friendship and love you today, tomorrow, and forever. I, GROOM'S/BRIDE’S NAME take you GROOM’S/BRIDE'S NAME to be my Husband/Wife, my partner in life and my one true love. I will cherish our friendship and love you today, tomorrow, and forever. GROOM’S/BRIDE'S NAME AND GROOM'S/BRIDE’S NAME I would ask that you always treat yourself and each other with respect, and remind yourselves often of what brought you together today. I Groom’s/Bride's Name , take thee, GROOM'S/BRIDE’S NAME to be my Husband/Wife- To have and to hold, in sickness and in health, for richer or for poorer, in joy and sorrow, and I promise My love to you. And with this ring, I take you as my Husband/Wife, for as long as we both shall live. I GROOM'S/BRIDE’S NAME , take thee Groom’s/Bride's Name , to be my Husband/Wife. To have and to hold, in sickness and in health, for richer or for poorer, in joy and sorrow, and I promise My love to you. And with this ring, I take you as my Husband/Wife, for as long as we both shall live. These are the hands that will massage tension from you neck and back in the evenings after you?ve both had a long hard day. GROOM’S/BRIDE'S NAME and GROOM'S/BRIDE’S NAME you have just sealed your relationship by the giving and receiving of rings and this is a pledge between two people who agree that they will commit themselves to one another throughout their lives. Today, this relationship is also symbolized through the pouring of these two individual containers of sand. One, representing you, GROOM’S/BRIDE'S NAME and One Representing you GROOM'S/BRIDE’S NAME and all that you were, all that you are, and all that you will ever be. As these two containers of sand are poured into the third container, the individual containers of sand will no longer exist, but will be joined together as one.Just as these grains of sand can never be separated, our prayer for you today is that your lives together would be blended like the seven seas and may your love swirl around each other like the changing tides. Pronouncement of couple as married. 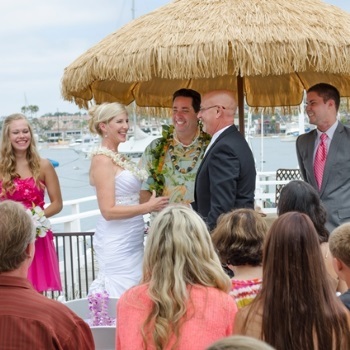 Today you have exchanged vows, leis, I dos, rings, blended the sand and have Pledged your Aloha to each other. So, By the power vested in me I now pronounce you . . . . . . .